It is that time of year that we are all getting ready to hit the air or road and go spend some time with our families for the holidays. A lot of the time it is a extended stay, whether for a week or two. If you are lucky, then you are bunking at a families house free of charge but a lot of times they just don’t have the room and your staying in a hotel. Which I’m not going to lie you might even like better especially if you pick the right hotel. 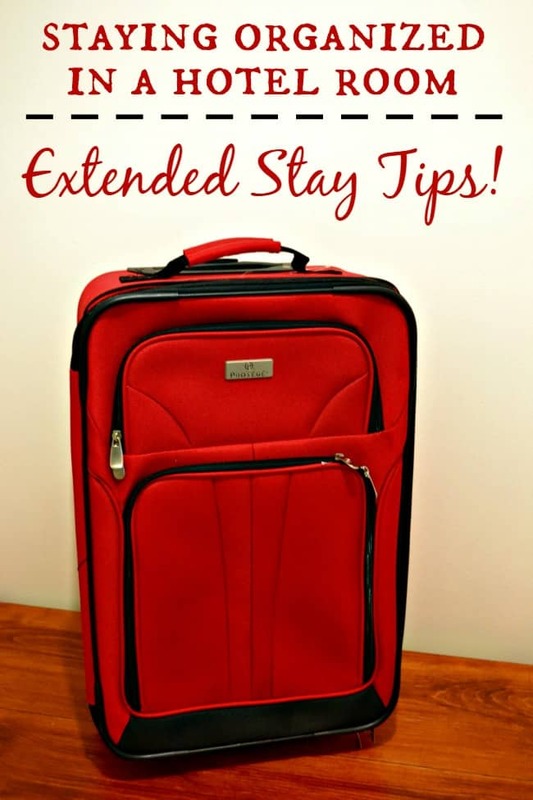 Being military and having had to stay in hotels a lot, I’ve picked up a few tips on organizing for long stays. Not this past PCS but the one prior to that we were in a hotel room for 2 weeks before we moved into our house. Two weeks with a husband, daughter and 2 large dogs. Yep, staying organized was a must! Even if you have planned everything out and crossed all your t’s and dotted all your i’s traveling can have a lot of unknowns and can quickly become chaotic. Take our last road trip to my parents, it took us 2 extra hours going and 2 extra hours coming back that we didn’t plan for. It happens! Thankfully, with a little planning ahead of time and a few of these organizational tips you might just get to keep your sanity. I am the queen of making lists and when it comes to traveling I like to make a list of all the things I need to bring otherwise something is going to get left behind. A good piece of advice is to print a duplicate copy so that you can also check that everything gets back in your bags or vehicle when you are leaving as well. 2. Organize the small stuff!!! When we are traveling for an extended stay we often travel with a lot of accessories whether that be tech gadgets, makeup, jewelry, etc. There are all kinds of great organizers for these and I personally like the ones with hangers so that you can hang them up and out of the way. I love the Eagle Creek Pack-IT organizers and picked up the Pack-It folder and the Pack-It Cubes at The Container Store. They can get your whole suitcase organized in a neat, compact and wrinkle free fashion. Needless to say my husband knows how to pack some clothes into a duffel bag. Being in the military he has done it a time or two and boy can they pack a lot of stuff in tiny spaces. Even he loves these organizers! We already established that we are staying for an extended stay so why live out of a suitcase the entire time? Unpack your bags! The dressers in hotel rooms aren’t just for looks but to help you stay organized and enjoy your stay. Make your hotel room feel like your home even for short stays. You will be more relaxed and sleep better too. 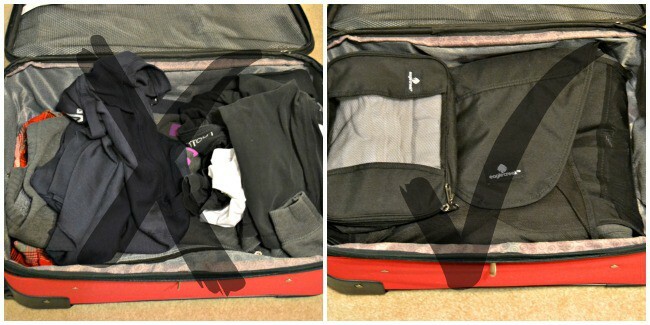 If you have packed enough clothes for the entire stay without having to do laundry then repack your suitcase everyday. It should be empty right? Since we just discussed unpacking it once you arrive. If you take the time packing away your dirty clothes as you go then your room will stay clean and on the night before or day of departure you aren’t running around trying to gather everything thrown everywhere. Stay neat! 6. Pick a great hotel!!! There are some hotels made especially for extended stays and one of my favorites is the TownePlace Suites by Marriott®. They cater to accommodating those who stay for long periods of time, which is usually considered at least 4 nights but usually more. One of the best features they offer is fully-equipped kitchens. When we had to stay in a hotel room for 2 weeks I don’t know what I would have done if they didn’t have a kitchen. Having to grab take out nightly gets old quick, even at the best places. They also offer on-site laundry facilities which is really handy when you have to stay for longer than a week. Packing for longer than a week is a pain. Plus who can resist the amenities you get for free like breakfast and Wi-Fi. 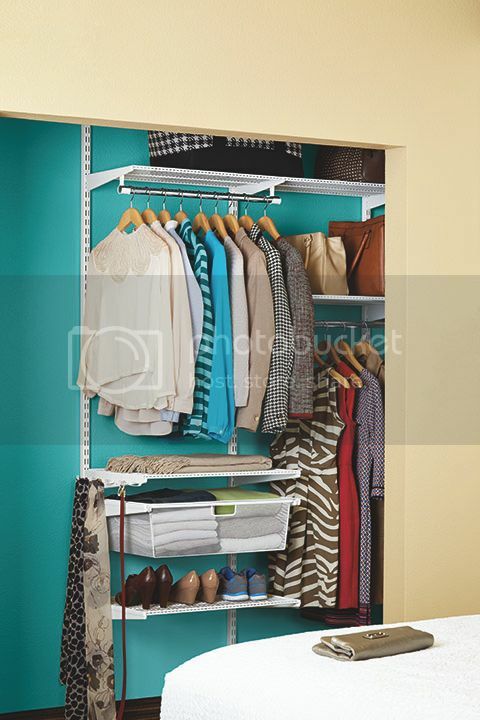 I also love that TownePlace Suites® and The Container Store® have partnered to bring the elfa® closet to their hotels. It is currently at 11 TownePlace Suites® but with more locations growing every month. What an awesome idea to bring a system many people already recognize and use in their own homes to stay organized. Definitely if you are needing a hotel for extended stays think about checking out TownePlace Suites®. I stay organized by packing my bags light, organized, and only bring what I will use, I roll my clothes to save room and time, I also unpack as soon as I arrive to the hotel to keep it all together. I stay organized by making lists of everything I need to pack and am packing and then using that same list to pack back up when it’s time to leave. I don’t have to worry about missing anything since I have a detailed list of exactly what I initially packed. I keep my shoes in a different bag and separate my luggage in half one half is mine, the other one is my husband’s and I also make a note of everything I am taking so that I don’t forget anything. We stay organized by being responsible for our own things and putting things back in their spots each day! I would take advantage of the shoe racks and shelving the most while traveling. I love the shelves and drawer in the closet. I like having all my things in one place instead of in dresser drawers and a separate small closet. You won the townsuites giveaway. They just need your email address so they can contact you. Please either reply here or email me at tglife82@gmail.com with your address ASAP. I would find the most use for the glide-out drawers. They would be useful for storing t-shirts and things like that.